I love this! A special sambal from the state of Pahang. It doesn't look appetizing being black, but for those of you who like having a sprinkling of spicy crispiness, you will enjoy this a lot on your rice and noodles! I made this as a condiment with noodles and we piled it on. My MIL who was intending to fly back to US asked me to make a big portion for her to bring along. 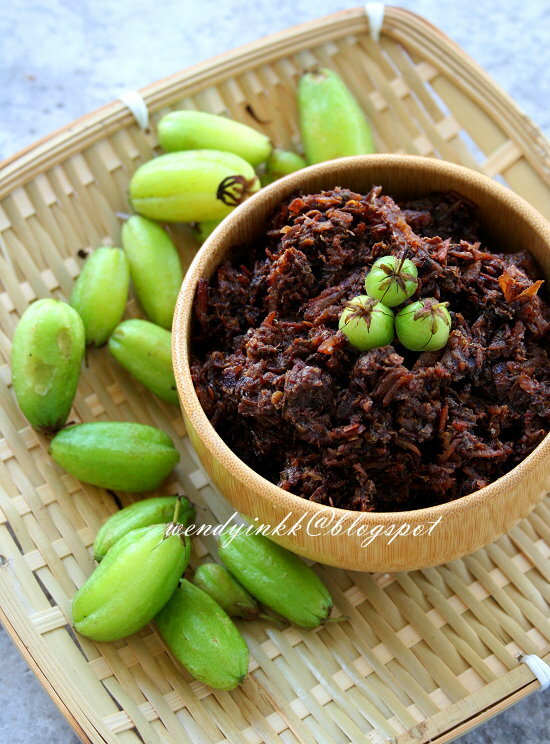 The ingredient in this sambal that makes it black is the bilimbi (belimbing buluh, kamias, tree sorrel). 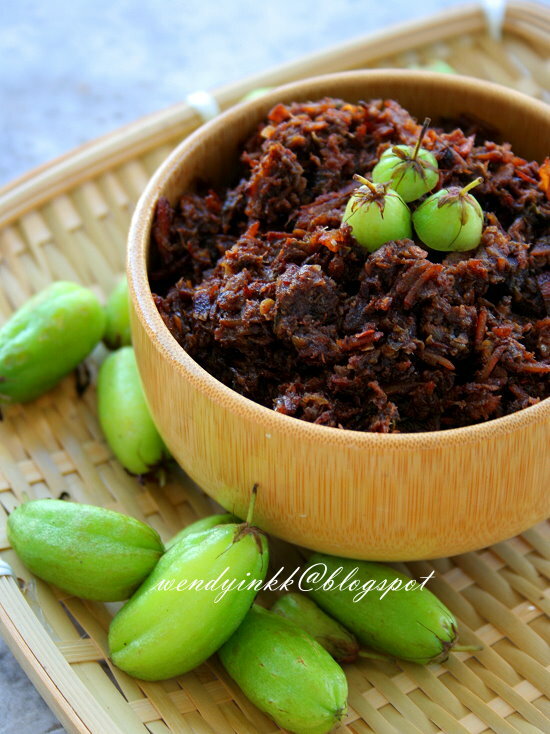 It adds a touch of fruitiness to the sambal and is easily available in KK. I also know that some bloggers like Veronica (in Klang Valley) and Alan (Singapore) has easy access to these fruits. Some recipes call for boiling the bilimbi until it's dry and black before use, but I am glad that the recipe I am using today calls for fresh bilimbi. My sambal is just as black as those that parboiled the bilimbi. I read in a few recipes saying that the original ones does not use sugar. I tasted it and yeah, it doesn't need any. I like it being salty, spicy and crispy. There's a light tinge of tang there, which comes from the bilimbi and it makes it extra special. But if you have tasted it and find you like it having some sweetness, go ahead and add some, but make sure you add it when it's almost ready, when the anchovies have turned crispy, if not, the sugar will burn before it's time to dish up. 1. 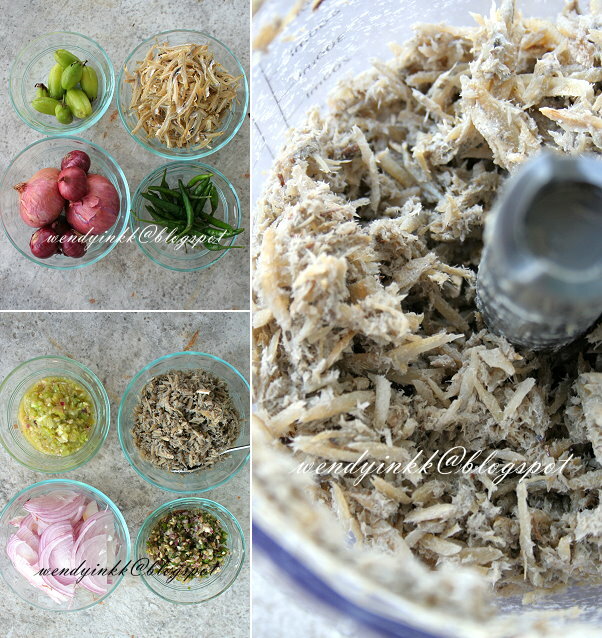 Rinse anchovies, drain and coarsely pound them (You can either mill, or use a food processor). Set aside. 2. Grind shallots and bird’s eye chilli together. Set aside. 4. Thinly slice red onions. 5. Heat a wok on medium heat and put in oil. Cook onions until it looks translucent and soft. Put in shallot chilli mixture. And cook until it looks slightly golden. *Taste it after step 6 to determine whether salt is needed. Different types of anchovies, different levels of saltiness. The sambal should be very slightly oversalted. I used 1/3 tsp salt. **Taste it after you add in the belimbi paste to determine whether sugar is needed. I didn’t put any. Look at the crispy anchovy shreds! It's quite addictive! You can make more and keep. 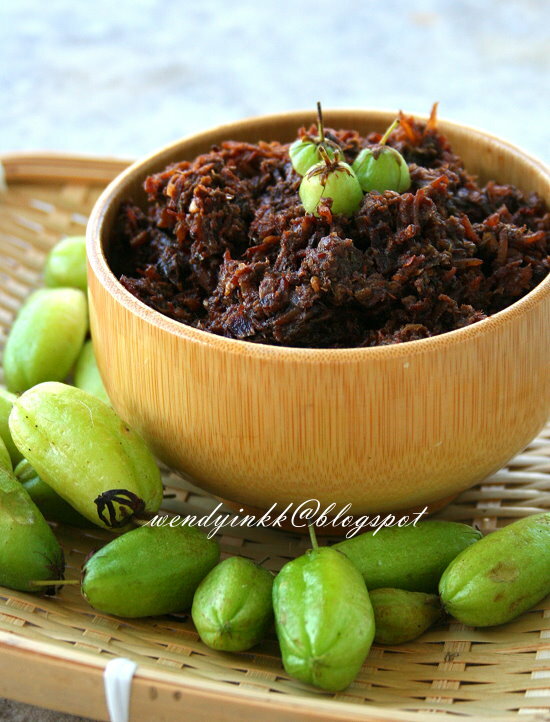 This recipe yields about 1 cup of sambal, just like in the pictures. Hi Wendy, I'm sure I like this although I have never tasted it before. Is there any substitute for the belimbi? Not sure if I can find this in the local market. This look great. Too bad I can't get any belimbi here if not for sure I will cook this. Oh wendy Pahang is MIL hometown dan home..MIL & Family Call this sambal is Sambal TUk TUK..sedapnya..nyumm..nyumm..eh sori sambal tuk tuk tak letak belimbing buloh tu..tp lebih kurang je..u should made sambal tuk tuk for yr blog.. This must be very appetizing....so long never eat this belimbing already. I will try this soon....sure very the SEDAPPPPP!!! wow.. drolling here.. this is my favourite! i like it very much until forgot about 'diet' asyik tambah nasi saja.. hehe.. I dun think so, maybe you can try a green star fruit, but the acidity level is different. This bilimbi is rather sour. Sprinkle on hot white rice I tell u heaven! I hope you get some soon! Thanks for dropping by and hahaha, tak ingat diet dah, hahahaha! Air liur meleleh tengok your belimbing and sambal! Betul ! This is a taste of heaven ! to me, it looks appetising, sounds even more appetising! 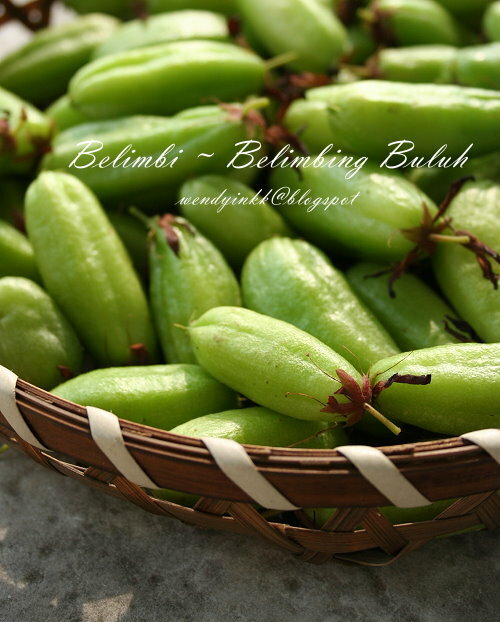 actually i thought i've seen belimbing in jj before but i think i probably made a mistake, it could be a kind of lemon. i think i will love this sambal too! I have a big big big love for sambal, and make it regularly here in London. but this black sambal I have never even heard of! I thinlk there really is much to learn about malaysian food! I always think sg/malaysian foods are quite similar so I def know the cuisines of both country, but apparently not! would love to try this! Boleh la... ada kot. Some ppl plant it around their house. Jusco definitely not. But Tesco maybe cos tesco do sell sayur kampung. Oh my, then I am worse, LOL. 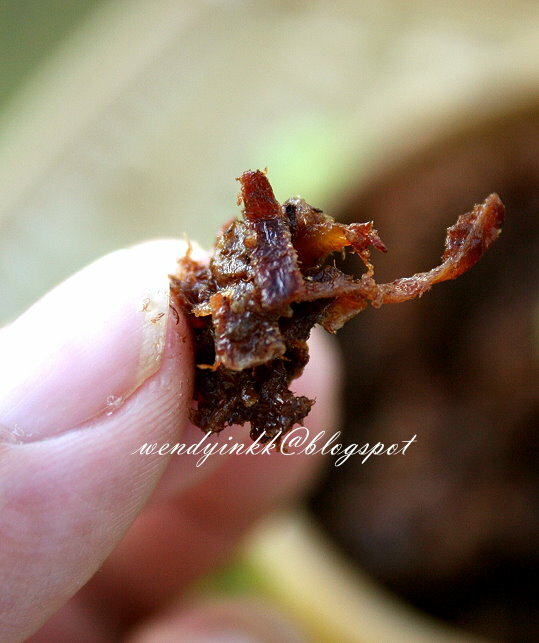 owh wendy, thanks for the short cut way in making the sambal hitam. Will try it once able to get the belimbing. I am making sambal belimbing hitam the tradisional way by boiling the belimbing for about 8 hours using my vision pot about 5 ltr saiz and will yield just enough to fit in 1.5l ice cream box. But unfortunately, i still could not reach the right colour just as your sambal. Mayby it's caused by the fish. I saw yours is whiter than what i have had it for my sambal. By the way, thank you for your idea.